What conditions does Pepcid AC treat? Tell your doctor right away if you have any serious side effects, including: easy bruising/bleeding, fast/slow/irregular heartbeat, signs of infection (such as sore throat that doesn't go away, fever, chills), mental/mood changes (e.g., restlessness, confusion, depression, hallucinations), seizure. List Pepcid AC side effects by likelihood and severity. Before using this medication, tell your doctor or pharmacist your medical history, especially of: immune system problems, kidney problems, liver problems, lung problems (e.g., asthma, chronic obstructive pulmonary disease-COPD), other stomach problems (e.g., tumors). What should I know regarding pregnancy, nursing and administering Pepcid AC to children or the elderly? Does Pepcid AC interact with other medications? 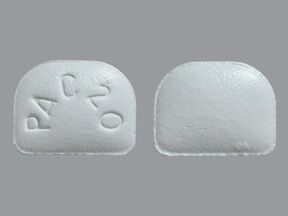 This medicine is a white, D, tablet imprinted with "PAC20". Have you ever purchased Pepcid AC?